January is National Bath Safety Month. 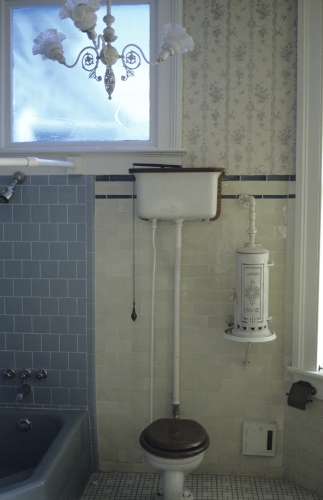 To celebrate that, I’m showing you an image from the Sweeney-Royston House in Galveston, TX. Granted, it is not the epitome of safety, like a walk-in tub, but I think it’s absolutely priceless. It is in the historic Silk Stocking District of the city that features houses that date from the Civil War period (1860–1865) to World War I (1914–1918). Although most of these houses had to be rebuilt after the hurricane of 1900, the neighborhood features a variety of historic late-1800s styles of domestic architecture. Can you think of a more charming bathroom than this, complete with chandelier? And how about this early version of the flush toilet? This is the siphon design that sends standing water in the tank to flush out the bowl, a design that was popular in the 1880s and is still used today in the UK. 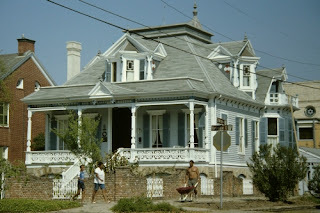 This house, on the National Register of Historic Places, was built by James Moreau Brown (1821–1895), as a wedding gift for his daughter Matilda (died 1926) and her husband Thomas Sweeney (died 1905). A Judge Royston and his two sisters lived in the house from 1911 until 1954. The house, variously labeled “Victorian Cottage,” “Eastlake,” and “Queen Anne” style, falls under the stylistic trend of late 1800s architecture that rejected the Gothic and Romanesque Revival styles that were so prevalent in the US at the time. Key elements of the style are projecting dormers with columns and pediment; cut out patterns on a prominent—often wrap-around—porch; and tall, thin chimney. Because of Galveston’s prominence as a seaport, this house includes a mariner’s wheel motif in the cutouts of the porch. Nicholas Clayton was born in Galveston and became a well-known architect throughout the South. He is primarily known for his work on grand private residences, but also he also worked on schools, churches, and commercial buildings. Clayton’s preference was to combine decorative elements of several revival styles (see this blog post for more about revival styles). American architecture of the late 1800s mimicked great styles of the past. The revival styles reflected influences from Ancient Greece through Baroque architecture. This house was largely devastated during the hurricane of September, 1900, and was rebuilt under Clayton’s supervision in the same style. An interesting feature of this bathroom is the conveniently low, wide bath tub. Studio activity: Using pencils to make a sketch and then crayons or colored pencils to fill in the shapes, design a bathroom with features that seem to make it a safe bathroom. Be aware of the size of the space being designed, and the convenience of features such as ramps, sliding doors, and rails for handicap accessibility. At the same time, try to design it so that it is colorful and inviting to use.